The crates said dried fruit from Colombia. There was no indication that they were holding tens of millions of dollars' worth of cocaine but that is what federal agents said they discovered in the biggest coke bust in New York in a quarter century. After what was described as a routine interdiction, the agents said they found 3,200 pounds of cocaine in a shipping container that arrived at the Port of New York and New Jersey on Feb. 28. The drugs had an estimated street value of $77 million. 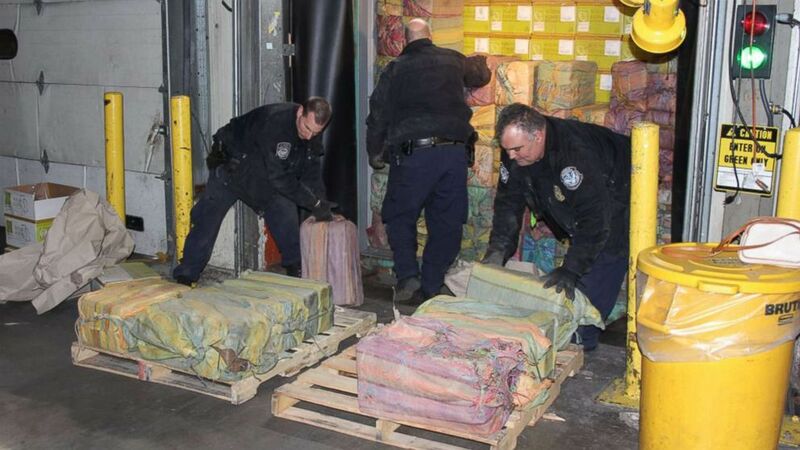 "This is a significant seizure, in fact it is the largest cocaine seizure at the Port of New York/Newark since May 1994," said Troy Miller, director of Customs and Border Protection's New York Field Operations. After agents boarded the ship, they inspected several containers and noticed the sealing pins for a particular shipping container had been tampered with, a source told ABC News. Agents x-rayed the container, opened it and that's when they discovered the cocaine, the source said. The cocaine was concealed behind boxes of dried fruit, according to a source familiar with the seizure. The cargo ship arrived in Newark from Buena Ventura, Colombia, and its next stop was Antwerp, Belgium. The Drug Enforcement Agency (DEA) is now working to identify the source of the drugs and who put it onto the ship, according to the source. Investigators are looking at several organizations who could be responsible and, eventually, they expect arrests. The cocaine resurgence is due, in part, because of a surplus in Colombia, which used to eradicate coca plants but no longer do that, resulting in an overabundance of supply. Traffickers are looking for a new market...which they find by mixing cocaine with fentanyl, creating what is, in effect, the modern-day speed ball. Authorities weren't sure whether the cocaine was meant for the United States or Europe, the source said, but the seizure was lauded for keeping the drugs off the streets. "Cocaine, New York's nemesis of the 90s, is back-indicating traffickers push to build an emerging customer base of users mixing cocaine with fentanyl," said DEA Special Agent in Charge Ray Donovan. "This record-breaking seizure draws attention to this new threat and shows law enforcement's collaborative efforts in seizing illicit drugs before it gets to the streets and into users' hands."